Best View in Brooklyn: Will the Tea Lounge Follow Other Displaced-by-Rent Slopers to Sunset Park? Will the Tea Lounge Follow Other Displaced-by-Rent Slopers to Sunset Park? I love my Gran Via coffee and pan de zanahoria, and I love that I can get a croissant at La Flor for 70 cents. The tortas at Don Paco Lopez are tasty, and for $5 you get a huge selection, with avocado to boot. However, they are not hang-out spots. Gran Via is popular (as it should be) at all hours, and its skinny bar with stools is usually filled with chatting patrons. The bakeries have some tables, but they aren't cozy. Delicious, yes. Affordable, yes. And efficient. Efficient is not the vibe of a hang-out spot. Here is one suggestion: There's a lovely, lonely spot next to where the new Amalgamated (the Slope gets more realty, we get more banks) is going in. 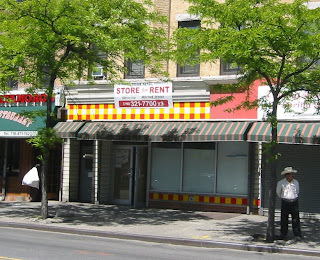 It used to be the Brooklyn outpost of the Guatemalan chain, Pollo Campero, which opened in Sunset Park in 2004. It lasted only about a year. I suspect because we have other amazing chicken places already here. Super Pollo is a favorite with fowl-eaters, and the rotisserie right outside the 45th Street Station gets good reviews as well. (This is all second-hand, by the way, because I don't eat chicken. So, take it or leave it.) That former Pollo Campero space has been for rent since 2005. Prime 5th Avenue corner, already plumbed for a restaurant, vacant for about three years! When they first went in, I thought they'd be there for a while. My veggie mind-set is naive about that. So, putting a Tea Lounge in that space would be ideal, for some. One major, guilty problem: it's just down the street from Gran Via. Would it affect the business there? Somehow, I don't think so. The clientele would probably be quite different. The influx of freelancers and odd-houred 20-30 somethings, many with children, would probably be the main visitors. It would be great to have a space like Cafe Sutra in "South Park Slope" or a cozier Has Beans around. At least I think so. And I'll repeat, I feel almost dirty admitting that. However, since nothing else has come in to claim the space for three years, I just want to walk by something other than a "For Rent" sign. So, is it just Wrong? It's not a Starbucks. And we already have the Dunkin' Donuts/Baskin Robbins stores in several places. We have a Burger King, a McDonald's, a White Castle. Why not a Tea Lounge? Is it really that much more Evil? Pollo Campero was closed down because of massive sexual harassment claims vs the owner. I remember when it was a store called So Cheap. They can't seem to rent that baby for love or money. We definitely need more places to get coffee and read the paper. My Sunday brunch place, Eclipse, is great - a steal for what they give you, but it isn't a coffee shop. I never really cared for the tea lounge, too dirty, but if they wanted to give our hood a shot I'd certainly welcome them.